Three Pounds is one of the more sought-after denominations. A rare denomination. Bank of Ireland £3 notes are the rarest. An older Provincial Bank £3 note. An older National Bank Three Pound Note. 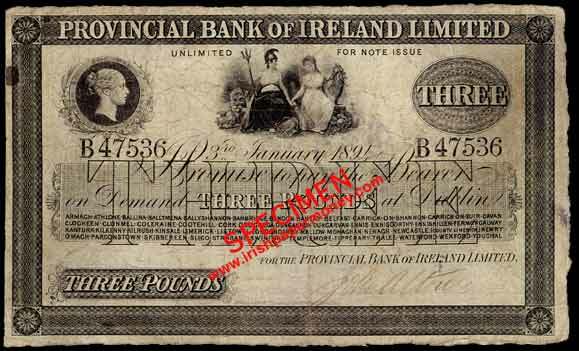 National Bank of Ireland £3 Three Pounds 1891. This is the earliest Bank of Ireland £3 note that I have come across. The scarcest Bank of Ireland notes tend to be from this era, when the bank was starting to add branch names to its notes. This banknote lists Carlow and Kilkenny as branch offices. 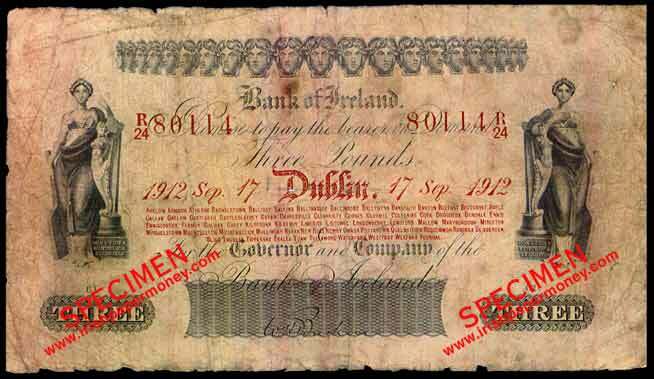 Bank of Ireland Three Pounds 1846. 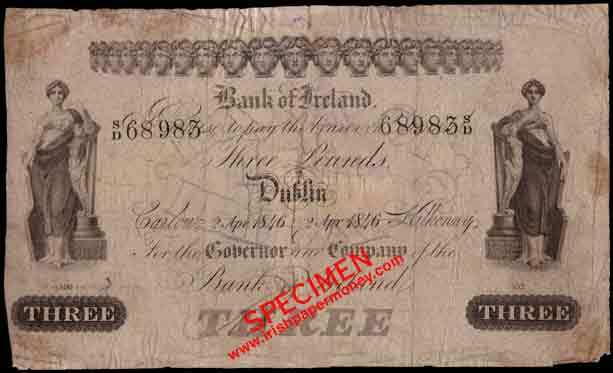 It appears that the Provincial Bank of Ireland may have adopted the £3 denomination before the Bank of Ireland. A £3 Provincial Bank proof is known with the date 1826. Last edited by DOC on 01 Aug 2018 19:23, edited 1 time in total. There is supposed to be a very early Ulster Bank 3 Pounder also, 1840s I think. Mac wrote: An older National Bank Three Pound Note. @Mac. Something wrong here, the picture is gone! Thanks for that, well spotted. I was moving some of the furniture around and changed the pic urls! Fixed now. Yes, here is an example of an issued £3 Ulster Bank note cut in half. The note is signed by John Raphael and dated 5th November 1845. These notes are extremely rare. I'd like to have the other half of this one!